Staying warm in one of Mattias knits today, where did summer go?! KNIT J Crew (mens department). SCARF Old one from Club Monaco (similar ones here). BANGLE Hermès. BELT H&M. PANTS Mango (similar here). BAG Céline. MULES Mango. 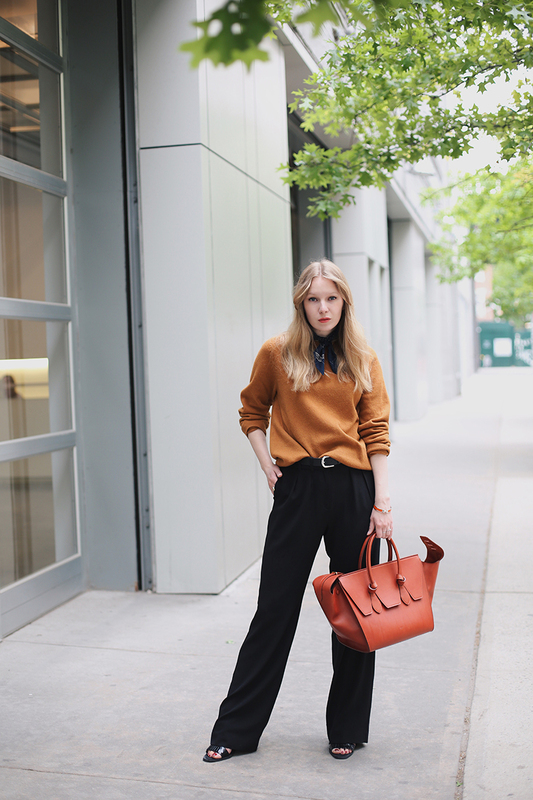 This entry was posted in Outfit and tagged Celine, HermÃ¨s, J Crew, mango by Carolina Engman. Bookmark the permalink. That’s a great color! It’s been a bit cold over this way too lately so I’m not sure where the heat went. Looking incredible in this outfit, so 70’s and so elegant!! Ooh, love the colour of that knit…and the bag is awesome. 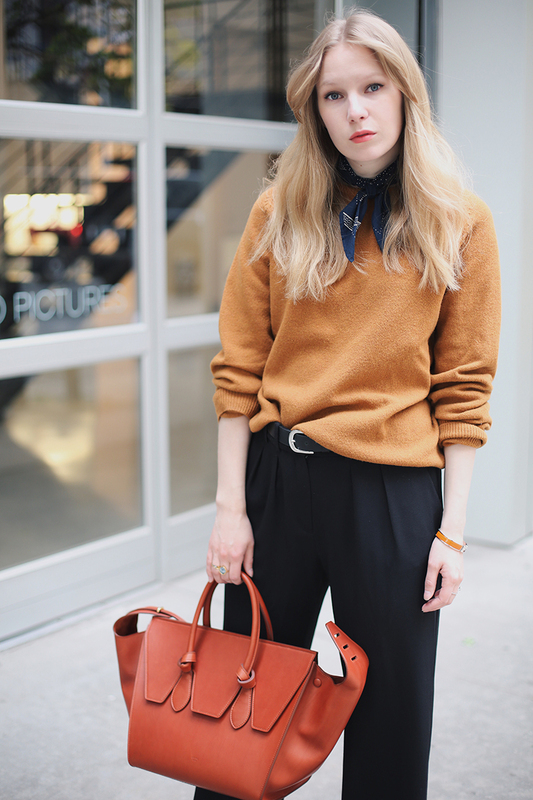 Loving the combination of that burnt orange coloured Céline and the mustard knit – just fabulous! It’s so cold here too at the moment, although granted it is almost winter in Australia. Still, I don’t deal too well with the cold (yet somehow managed a winter in Canada? – weirdo). Hahaha! I love this effortless, yet chic look! Especially the mustard sweater. It really suits you :) The bag adds a lovely accent too. I love how you take on cold spring days with an amazing 70s look. Totally loving this knit! Big knit sweaters are legit my favourite thing to wear :) It is getting too hot for that now, but thats okay with me too! I love this outfit! Gorgeous bag! http://trendkeeper.me .. The half annual sale & a budget buy?! What a unique colored sweater. Love this minimalist look, very classy and effortless! Love this, simple and effortless. Love this look! Beautiful and so stylish! Fab bag! Really beautiful, and the pictures are great. Those colours look great on you. Such trousers doesn t fit everybody but looks good on you. You look so classy! Loving it. This outfit is so simple but gosh so elegant that I can’t take my eyes of it! And I love this accent that you made on this cute little scarf on your neck – looks really gorgeous! Gorgeous outfit, love your Celine bag! This outfit looks great on you, you should borrow Mattias’ jumpers more often. I love the neck scarf detail, for me this just makes the outfit. I hope the warm weather returns soon. So chic and stylish! Love this look! Love this look, very classy, the colors are so chic! You look amazing, love your bag ! LOVE THE COLOR, IT LOOKS QUITE NICE ON YOU. Gorgeous! <3 Looks so classic and effortless. Absolutely in love with this look! You look super chic and I love so much the retro vibe of this outfit! That Céline bag is reallly beautiful.. This look is sooo chic, I love how you combined the sweater with the Céline bag, so chic ! Gorgeous! Love the color of the jumper!! Love love love and will wear in the Fall after we finally get some summer here in Chicago! Beautiful ensemble. Love the combination of colours in this outfit! Love the outfit – you look fab! Exquisite look! The burnt orange and mustard combo are colors that have taken a back seat in recent years–so happy to see they are coming out again. I wish my BF loved sweaters from J Crew because I would be raiding his closet right now! Ha ha! Very chic and stylish, the bag is so beautiful. I’ve always loved mustard, such a classy color. chic look! You have very beautiful photos . Come on my blog http://lookmake.ru ‘ll be glad to see all ! This look is so on point! Just wonderful! Love the way you styled the sweater! I LOVE that classic outfit. It fits sooo good to you. Love color of your sweater my dear! Summer?!?!?! What is it??? ?